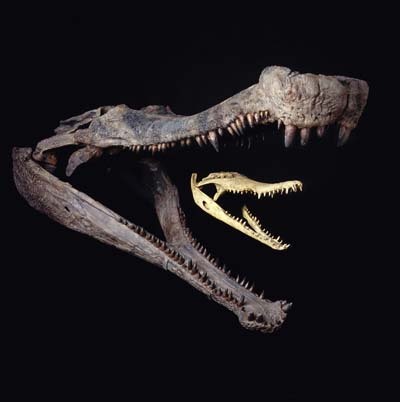 The giant African crocodyliform Sarcosuchus imperator lived more than 100 million years ago. It weighed eight metric tons, measured up to 40 feet in length and dined on small dinosaurs. In the Oct. 25 Science Express, Paul Sereno at the University of Chicago and colleagues describe the newly discoverd fossil skulls and partial skeletons of this giant – pulling Sarcosuchus out of the El Rhaz Formation in Niger and on to the pages, screens and speakers of the popular press. Below are links to just a few of the stories in the media on the Sarcosuchus fossils, as well as the study in Science.